Back cover blurb: A woman; a war; a child that changed everything. Spanning the sweep of the twentieth century, We Must Be Brave is a luminous and profoundly moving novel about the people we rescue and the ways in which they rescue us back. She was fast asleep on the back seat of the bus. Curled up, thumb in mouth. Four, maybe five years old. I turned around. The last few passengers were shuffling away from me down the aisle to the doors. ‘Whose is this child?’ I called. Nobody looked back. December, 1940. As German bombs fall on Southampton, the city’s residents flee to the surrounding villages. In Upton village, amid the chaos, newly-married Ellen Parr finds a girl sleeping, unclaimed at the back of an empty bus. Little Pamela, it seems, is entirely alone. Ellen has always believed she does not want children, but when she takes Pamela into her home the child cracks open the past Ellen thought she had escaped and the future she and her husband Selwyn had dreamed for themselves. As the war rages on, love grows where it was least expected, surprising them all. But with the end of the fighting comes the realization that Pamela was never theirs to keep… A story of courage and kindness, hardship and friendship, We Must be Brave explores the fierce love we feel for our children and the astonishing power of that love to endure. We Must Be Brave, is a sentiment that the reader should probably keep in mind whilst reading this beautifully written novel, for its subject matter is at times difficult to endure. We Must Be Brave is a novel that focuses on the trials and tribulations that must have affected many families during the second world war, but this perspective is rarely written about. Ellen Parr is a newly-married, childless young woman who finds a girl sleeping, unclaimed on the back of an empty bus. The bus has recently arrived from Southampton whose residents have been made homeless by relentless German bombers. Little Pamela it transpires is entirely alone in the world. Abandoned in the chaos at Southampton, her Mother now dead in a bombing raid, Pamela (on her part somewhat reluctantly) is taken in by the Parr family. After an attempt to place her elsewhere, the Parr's come to accept Pamela as their own, despite her poor behaviour, which was no doubt common of a child in her situation. After desperate attempts to contact any remaining family are exhausted, the Parr's form an unbreakable bond with the child and don't expect that she will ever see her real family again. Ellen's world is turned upside down when a relative stranger appears on her doorstep, her face familiar, but Ellen cannot understand why. As she explains her reason for her visit, Ellen realises that she could be about to lose everything she never knew she wanted. We Must Be Brave is a very moving novel, but also uplifting novel, and I was bereft when I go to the end! This deserves to be one of the books of 2019, and I cannot recommend it enough. 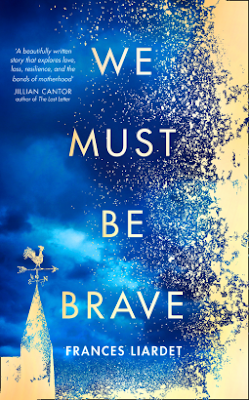 We Must Be Brave is available from 7 February 2019. You can pre-order it now via Amazon online and all good book shops.